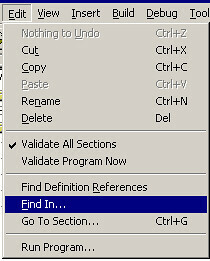 Application Designer has an option to search through the text of the code, but it takes way too long to search the whole system on a regular basis. Thankfully, Application Designer also has a way to dump all of the code to a text file. Important: This will take a long time and a lot of memory to finish. So, increase your virtual memory and let it run overnight. If you have a team of developers, have one person do the dump and put it on a network location where everyone can view it. If so, go to the control panel and open the System icon. Go to the Advanced tab and click the Settings button under performance. Under the “Advanced” tab in the performance options dialog, change the virtual memory. The steps to increase the memory might be slightly different depending on your flavor of Windows. 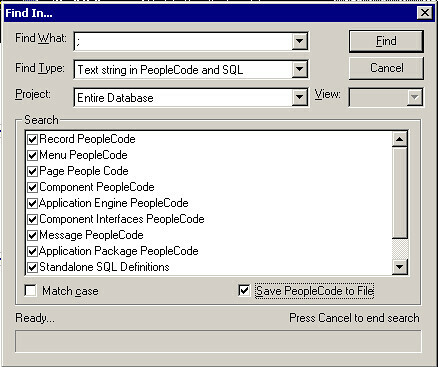 Ok, I have seen this several places, but I have link it here too: A java program has been written that will read PeopleCode from a PeopleSoft database. It looks like the program was created with information from PeopleCode Secrets. I would love to create a project on SourceForge for this code. There are so many things that you could do with it. I would love to index the PeopleCode in the system to make searching and refactoring easier. Oh well, maybe one day.